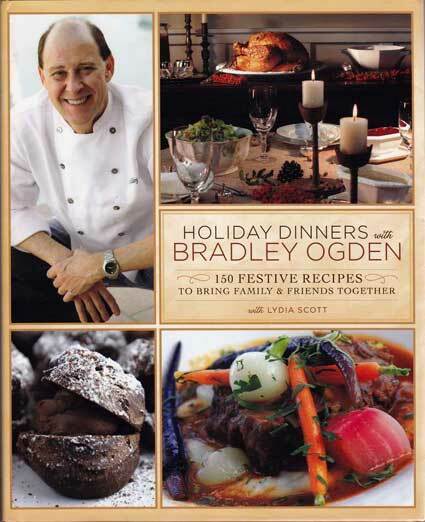 Chef Bradley Ogden shares secrets to create simple yet impressive holiday feasts in “Holiday Dinners with Bradley Ogden: 150 Festive Recipes to Bring Family & Friends Together” during his new cookbook signing at his Caesars Palace Las Vegas restaurant November 21. Sharing a meal with family and friends is a holiday tradition that never goes out of style. Las Vegas visitors and residents are lucky enough to enjoy Bradley Ogden’s cuisine at his Caesars Palace restaurant, winner of the James Beard Award for Best New Restaurant in 2004. Now the two experiences can be combined as famed Chef Bradley Ogden helps bring the feeling home by sharing his secrets for making holiday celebrations as delicious and easy as possible in his new cookbook, HOLIDAY DINNERS WITH BRADLEY OGDEN: 150 Festive Recipes to Bring Family and Friends Together (Running Press; October 2011; Hardcover $30.00). On Monday, Nov. 21 starting at 5 p.m. guests at Bradley Ogden inside Caesars Palace will have the chance to meet Ogden and have him signs copies of his new cookbook. The event is open to the public and cookbooks will available for purchase at the restaurant. “Eating at any of Bradley Ogden’s restaurants has always felt like a celebration. So a holiday cookbook from Bradley is ideal. And if you aren’t a personal friend who is lucky enough to be invited to Bradley’s own home for the holidays, Holiday Dinners with Bradley Ogden is the next best thing: You get to cook his recipes, and serve them to your guests as your own holiday creations!” said Wolfgang Puck, who has his own restaurant, Spago at The Forum Shops at Caesars Palace, just steps from Ogden’s Caesars Palace restaurant. Chef Ogden provides home cooks with the tools they need to create an impressive meal, one that combines the enthusiasm of the new with the comfort of tradition, and still allows them to spend more time with friends and family and less time prepping in the kitchen. With more than 150 recipes for Thanksgiving, Christmas, and New Year’s, as well as a superb menu for summer celebrations, HOLIDAY DINNERS WITH BRADLEY OGDEN takes the guesswork and stress out of holiday preparation. Foolproof techniques: how to carve a turkey, use bain marie, etc. Chef Ogden’s recipes will reinvigorate your family’s holiday feast with exciting yet familiar recipes that are driven by the bounty of the season. Bradley Ogden is a renowned and award-winning chef and cofounder of the Lark Creek Restaurant Group. His career began at the Culinary Institute of America in New York . Upon graduation Bradley was the recipient of the Richard T. Keating Award given to the student most likely to succeed. He has been the recipient of many awards including the James Beard Best Chef: California , James Beard Best Restaurant in America for Bradley Ogden, Golden Plate Award by the American Academy of Achievement and Chef of the Year by the Culinary Institute of America. He lives in Santa Ynez , CA . Co-author Lydia Scott is the Chef/Owner of EatThisLA.com, an online snack company that sells healthy snacks and desserts.